After the announcement of the Awami League President Sheikh Hasina to attack with logi-boitha, the Awami terrorists of Kurigram district, like their compatriots all over the country, murdered Shaheed Muhammad Rafiqul Islam on October 28, 2006, at Kurigram. He was in a procession, when the Awami terrorists attached with fire-arms and rods and oars. After being injured due to police lathi charge in the BNP Jamaat rally, the Awami terrorists attacked with their weapons and beat him severely. He died 30 mins after being taken to Rangpur Medical Hospital. 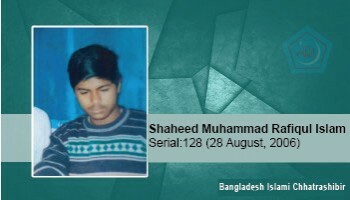 Place of martyrdom: After 30 minutes after taking to Rangpur Medical College, he got martyrdom. After 30 minutes after taking to Rangpur Medical College, he got martyrdom.